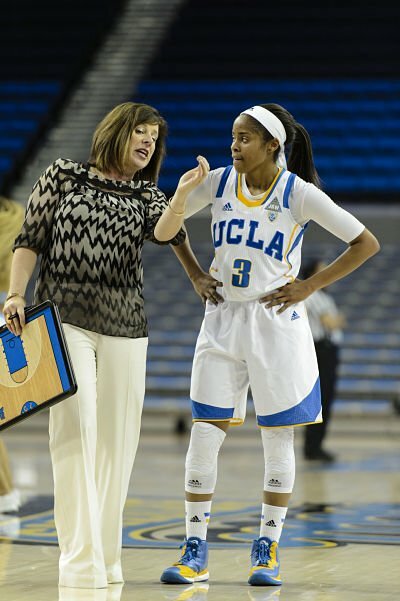 Cori Close is in her fifth season as UCLA head coach. Photo by ASUCLA. 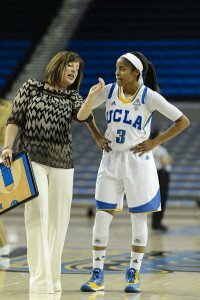 Cori Close is in the midst of her fifth season as UCLA’s head coach, and her 23rd season of coaching overall. This is her first head coaching assignment, after being associate head coach or assistant coach for teams that advanced to the NCAA Tournament 16 seasons, won at least 20 games in 16 seasons, and won or shared a total of 11 conference championships. 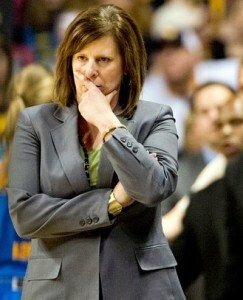 Close began her coaching career at UCLA in 1993, when she was a graduate assistant for women’s basketball for two seasons. After that she spent nine years as assistant coach at her alma mater, UC Santa Barbara, including the last three as associate head coach. Close then went to Florida State, where she was associate head coach for seven years to head coach Sue Semrau, helping guide the Seminoles to elite status. 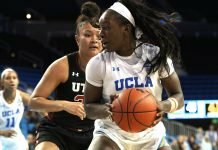 Last season the Bruins won the WNIT championship, and they have spent most of this year ranked in the top 25, with their highest spot at 12 earlier this month. 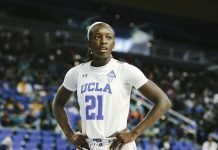 Sue Favor: Let’s start in the present: What an interesting twist for you to get your first head coaching position where your coaching career first began, at UCLA. What did that mean to you when you first got the job? What was it like returning after so many years? Cori Close: It is unusual – I never would have predicted it. When I was named head coach I was humbled, thankful, excited and deeply motivated to pay it forward. Sue Favor: Ann Meyers Drysdale said you had a relationship with Coach John Wooden. To what was she referring? Cori Close: There were a few of us that he took in and took under his wing when I was there as a grad student. We would go to his house every other Tuesday, and he became a mentor to us. I developed a relationship by keeping in touch with him. He saw his job as to impact others, and he always considered himself a teacher, not a coach. It is so cool to get to carry on a fraction of his principles. The first time I went over he asked my name, and then asked how I spelled it. He said, “my granddaughter is named Cori, and she spells it that way.” (His daughter) Nan Wooden would come by sometimes. Sue Favor: Back to your Florida State days: What were the most important things you learned there? What was it like working for Sue Semrau? Cori Close: She’s really amazing. When I think of all the people I’ve worked with, I can see their influence on me At FSU, I had an incredible opportunity to learn what it’s like to be in a high-level BCS program. She taught me how to mold a complimentary staff and create a culture. It is so much more than the games. One great thing about Sue is how she allowed her staff to be different. I have tried to follow in those footsteps. Sue Favor: You’ve had various responsibilities in your years as an assistant coach and associate head coach. What are your greatest strengths as a coach? Cori Close: Knowing what I need to adhere to and surrounding myself with amazing people. I am self-aware enough to know the areas where I need some help. You’re deceiving yourself if you think you can do it all on your own. I have the vision to see what I need and to create a clear direction to get from A to B. I know what caring about people will pay off over time. Sue Favor: What does it mean to be an associate head coach? How is that different from being an assistant? Cori Close: It depends on the program. As as associate head coach, you’re telling future AD’s that you want to be a head coach someday. Being secure in your role is more important than the title. At Santa Barbara I build the donor and booster programs. At FSU I was Sue’s encourager, and I managed X’s and O’s. I could draw up last-second plays; I was a decision-maker. Sue Favor: You have stayed within your coaching positions for several years at a time. Is stability a foundation of your personality? Cori Close: I hate change, and I love community. That was my big hesitation in coming to LA: how could I make it smaller? So I live five minutes from campus. Sue Favor: You show a lot of hospitality and appreciation towards fans, media and others at Pauley Pavilion, and so do your players. Where did that come from? Cori Close: It’s a big challenge in LA to make people feel a part of the program and not like they’re just there watching. We’re at a critical point in our game where we’ve got to grow it, and that means fans and media. If I don’t say thank you, I’m missing the boat. You’ve got to have a broader version than yourself. Cori Close explains a concept to point guard Jordin Canada. Photo by ASUCLA. 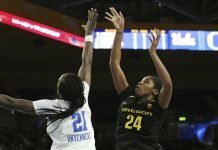 Sue Favor: What was your vision for the Bruins when you took over the program? Have you achieved your goals yet? Cori Close: It never goes as fast as you want it, or as you see it in your mind. We don’t have an NCAA championship – there’s an empty space with all the (men’s) banners. My eyes kept going to that empty space, because women’s basketball is not included in UCLA’s 113 championships. That’s the pinnacle; I want to hang a banner. Sue Favor: What do you want your legacy to be? Cori Close: We’ve created an uncommon transformational experience for young women at UCLA. In 10-20 years, I want our players to think, I’ve done X-Y-Z in my life because of my time at UCLA. We want to go to the highest levels of basketball, but it has to be deeper than that. Sue Favor: What does Coach Close do for fun? Cori Close: I’m a total homebody, and a self-admitted TV junkie – that’s my escape. I love photography, and I love to catch the perfect sunrise. I love to entertain and have people over. I’m pretty simple; I love to work out.